My first introduction to the IT world was when my colleagues used key punch cards to put in functioning commands into computers. I was not brave enough to go near a computer until they became desktops but with monochrome screens at best. I worked in these DOS-based programs on those green screens and white type until finally they became black screens with white type. Being a visual person, I thought to myself, “There has to be a better way.” In my mind’s eye, I saw a better functionality to a more user friendly computer and one day the windows interface was born. Also, around this time period, I had dreams, wonderful dreams. In them, I saw a static picture on a document or book and then it would automatically and magically come to life. I saw a movie within a book telling a more profound and detailed story as it played out it’s story. In my mind’s eyes, I saw an exciting future. Well, the future is now upon us. 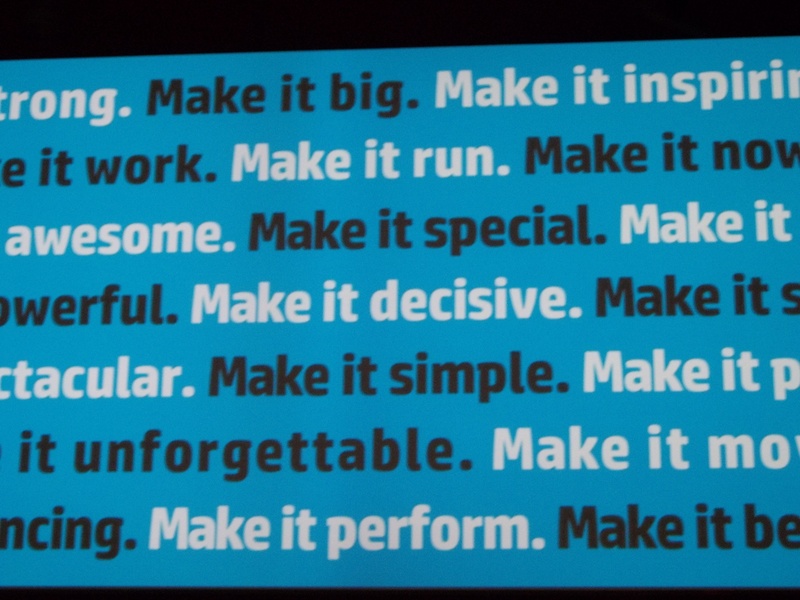 While attending the HP Discover 2012 Conference, I witnessed something most incredible. Stouffer Egan, CEO of Autonomy, gave an excellent presentation on “Information Optimization: Big Data” which ended with an incredible demonstration near the end of his talk. In succession, he took out three examples. 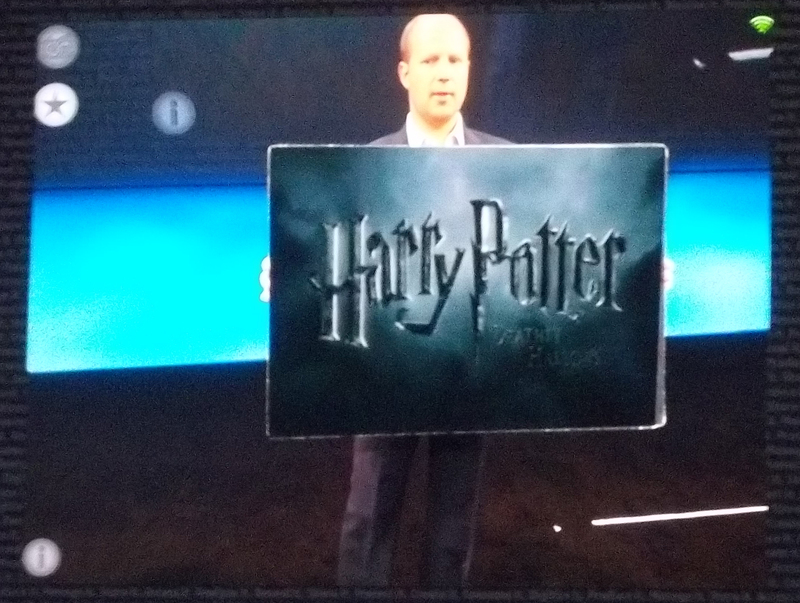 He set up the stage so that he was using what appears to be a new generation of a HP Pad which could read and showcase the information he was about to show us. 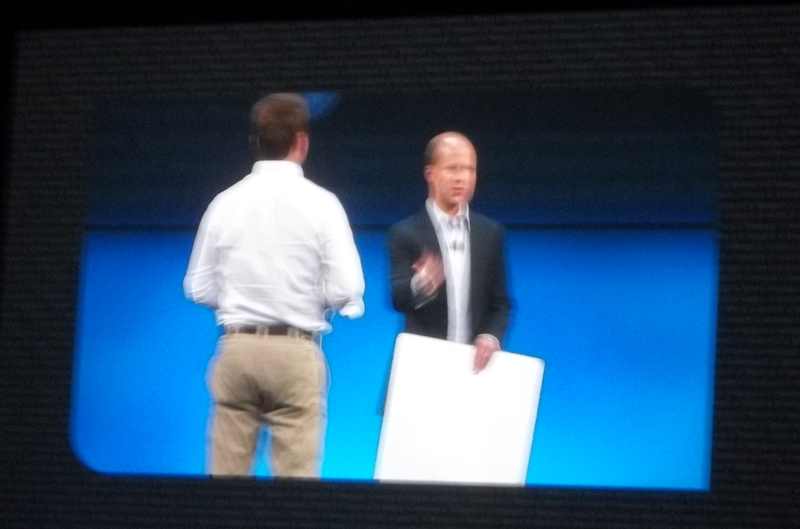 A camera was brought in so that we could see what the HP Pad sees and what the consumer could now also view. First, he brought out a plain white placard. He positions the HP Pad in front of it and then a trailer for the Harry Potter movie starts to play. The amazing part is that there is only a blank board there, but now there is a movie trailer showing. See the image below. Dynamic information and advertising are a simple step away. Then, he brings out another larger placard which simply is an enlarged copy of a newspaper with a picture on it. He places the HP Pad to read it and what we see is that the static picture now becomes an actual TV live stream of a news station with news reporters who are updating the story with the latest breaking news specific to that story. The static picture somehow changes into a real-time video and audio newscast. This is taking communication and interactivity to a whole new level in the most timely manner. Finally, he takes out the largest of blank boards but this time he turns it over to show a rendering or representation of a comic hero. It is over six feet in height. Once more the HP Pad is focussed in on the placard. The camera connects us to what we can now see. Iron Man appears in front of us in 3D form! I am not kidding. When you look visually with your eyes onto the stage, nothing is there. However, when you look through the HP Pad and the camera which is now showcased on the huge overhead screens, you see a holographic image of Iron Man that is moving. You see him blast off the stage into the air and then come softly back down for a landing. Only then has the very quiet and respectful audience of IT specialists break their silence with “Ooohs” and “Aaahs” and “Wow!” The future is now around the corner for the average consumer to interact in a totally new concept of reality. I know what I visualized a few decades ago but I never thought it would come to pass so quickly if at all. I guess it is like the expression that “If you can visualize it, it can be achieved.” I am so thankful that there are people within organizations like HP and other computer companies who can make our lives more interesting and more dynamic. Although I had the vision of these possibilities, I had no way of making it come to fruition. I am happy with this progress but the other philosophical side of me asks, “How much of reality are we blurring? Will we know what is real or not soon?” I can’t help but think of the Matrix movies, as well as the comparison of life and dreaming to the movie of Inception. I think of how there are worlds within worlds. People have gone through the World Wide Web of the Internet to sub-worlds of internal web-structured worlds, such as Social Media sites like Facebook and Twitter. People are starting to exist so much in this manner and almost exclusively in these sub-worlds that actual human face-to-face interaction is turning into a premium and a minimalist activity. Is this ok or is this just another orientation and change in our communicative forms? Maybe now we get to connect with more like-minded people by choosing what aspects of our lives we choose to pursue and with whom. I may have become philosophical but the questions do remain to be considered and should be discussed. Progress is needed but how do we deal with it? How do we keep pace with it? What are the benefits of virtual worlds? Are we growing and developing as a society and individual human beings? How do we incorporate these great technological advancements while not losing our grasp on reality or our humanity? Jeffrey Katzenberg spoke of how 18 years ago, he had made a mistake that was not something he could have prevented or known would even happen. He showed us a video clip from a conference he attended and spoke at. He brought out a live lion named Poncho but even though he was chained and handled by two trainers, the lion who was the basis on which the “Lion King” was featured and animated, took his love and adoration of Jeffrey to a close affection nearly knocking him off of his feet as the animal tried to get closer and closer to him. Jeffrey brings up this lion to show how Poncho, like technology sometimes works for you and sometimes it does not as unpredictability can happen. Poncho pounced all over him but luckily he had the aid of two qualified professionals with him. 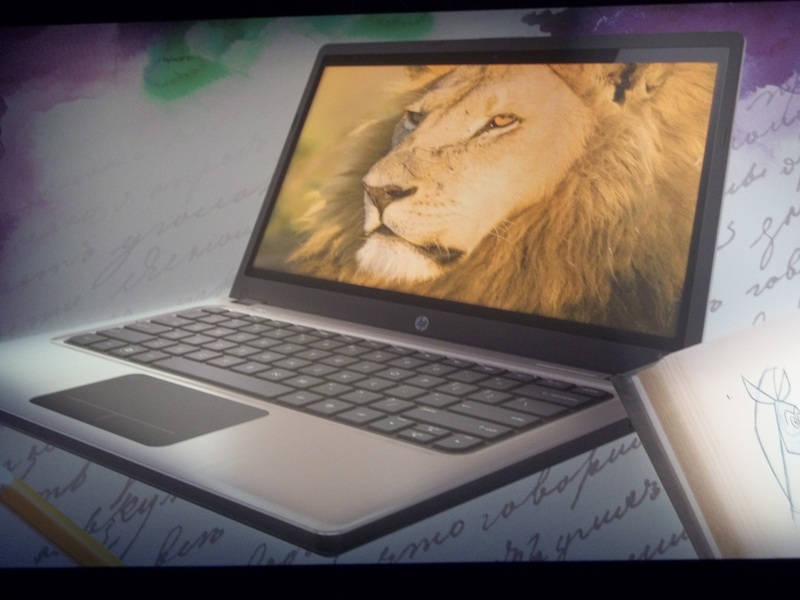 In like fashion, Jeffrey speaks of his initial and ongoing relationship with HP. He first met the CEO of HP, Meg Whitman when they worked together at Walt Disney. He is so confident in the relationship and workability with Meg Whitman that when the company, Dreamworks, went public in October 2004, he invited her and some other prominent CEOs to sit on the Board. Jeffrey showed an animation video where they started as hand-drawings of pencil, ink and zinc to colour animation to computer generated digital characters and then into 3D animation. In 1994, Dreamworks produced the Lion King. Soon afterwards, the company made Shrek which was the first animated film to receive an Academy Award. With each producing film, Dreamworks had to restructure so as to produce an exceptional line of animations. This meant retraining of staff in a massive effort and also a need for more data capability. In 2004, Jeffrey saw “The Polar Bear Express” and was very impressed with the 3D animation of Castle Rock Entertainment in association with Shangri-La Entertainment. This brought on yet another new stage of development with more complex demands. In 2009, they were now capable of developing 3D animation. Jeffrey jokingly spoke of how Moore’s Law demands doubling computer processors in complexity every two years and with his version, Jeffrey’s Law, well he wants/demands/expects more than Moore’s Law. He detailed how it takes 3 billion integrations for a film that takes approximately four years to produce. He spoke of how an excellent animator can only produce 3 seconds of animation in one week’s amount of work. He spoke of how the character has to be built in components of the body, the face, the fur or the hair by separate animators. He told us how it takes 8 hours of rendering time once it has been modelled appropriately. Now, another stage has commenced. Scalable multi-core processors has changed due to work with HP and Intel engineers. Finally, full resolution will be available in real-time. This expands the venture to a point where an animator can work at the speed of her or his imagination. This revolutionizing development will help to make films better, faster and cheaper. Not only the process but the product profits by this development. Dreamworks will be able to downsize from twelve departments to five or six. Jeffrey speaks of calling on the bat phone to HP for help. They preferred the CRT monitors as they had better consistent colour validation than the new flat screen technologies. In fact, they held onto them until they were burnt out. Although great for the general consumer and office worker, it was not of a benefit for the animator or creative person. They worked with HP to develop a colour monitor that worked even better for them that the old CRT monitors. For all these reasons, Jeffrey Katzenberg recognizes and appreciates what HP has done for them as they have grown to being the best and biggest state of the art animation studio. He reminded the IT group that is because of Meg Whitman’s 3 pillar vision of Cloud, Security and Information Explosion that they have been successful in developing and producing a collaborative working relationship. 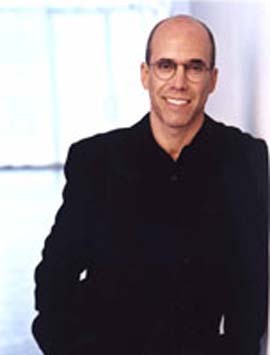 First, Jeffrey Katzenberg indicated that they were one of HP’s first Cloud clients due to the nature of their work around the world be it in American cities, to Bangalore and now Shanghai. Second, as the film industry is known for video piracy threats, it was extremely important to keep their files secure. Third and finally, he showed us how only 2 ½ minutes of animation took 6 terabytes of data storage. With this increasing need for information, Dreamworks has collaborated with HP to deal with these three major components. With over 20 produced films, with 10 in production at any given time which on average takes 5 years to produce, Dreamworks relies on its partnership with HP. With the upcoming release of Madagascar 3, Dreamworks is able to produce high quality animated films that become an integral part of our culture with lines such as “Only penguins and people can drive!! !” When the movie comes out this Friday, you’ll understand this last line. In a conference room filled predominantly by males in the Information Technology industry, a woman stands before the thousands of listening ears and looking eyes. 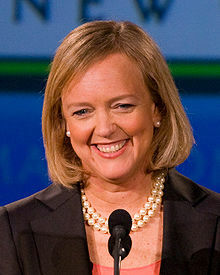 This woman, Meg Whitman, has had a past of working for some of the best companies such as Proctor and Gamble, Walt Disney and Ebay. In some cases, the companies were already well established and well known but in the case of Ebay, she took the company from a smaller company making millions to now billions of dollars annually in revenue. Meg Whitman as CEO of HP, has only been with the company for eight months, but already she has a vision of where to take the company. She told us of how HP makes a difference and this goes along with the Discover 2012 Conference’s slogan, “Make it matter.” She outlined how HP has helped the UK Ministry of Defence. Information Technology experts actually volunteer for this “mission” and put on bullet-proof vests to be in field operations with the soldiers such as they have done in Afghanistan. The purpose is to help the UK Ministry develop strategies on how better technology can serve the military. This HP difference makes them different as a corporate company and citizen. Ms. Whitman spoke of the tectonic plates of the IT industry moving. With this in mind, she reminded the IT people that the industry needs to become more open and ubiquitous. From the cloud, to social media, to data storage, to security, to speed, to agility and to costs, these are all factors and considerations for this company. Meg Whitman challenges the CIO to deal with the changing landscape. The market place and the current models are changing. To orchestrate the information flow and open the architectural systems, the CIO has to strategize and Meg Whitman points how HP can be the one to do this. She spoke of a four pronged attack of 1) Solutions 2) Service 3) Software and 4) Infrastructure. Meg Whitman gives another example where they helped the Bank of India over a 5 year period to return a 200% increase. HP starts off its conference, Discover 2012 in Las Vegas, with a host who is no surprise to the computer world. He is Raj – ajesh Koothrappali who is really Kunal Nayyar from the Big Bang Theory. As he admittedly speaks of playing a genius but not really being one, he acknowledges and appreciates the work done by the computer geniuses in the audience and particularly of HP (Hewlett Packard). Kunal sees how throughout history, people have been satisfied with the progress that humanity has made through life relative to accomplishments of the time but how someone comes along to see how technology can better the human race in ways that they have not had the chance to conceptualize of yet. These computer geniuses see a way of using technology and its applications for the betterment of humanity and are always striving to make life easier or better in some respect. 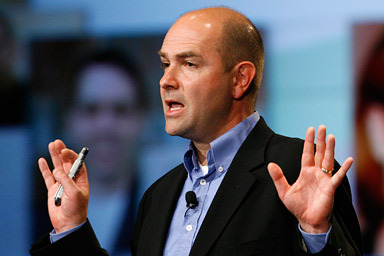 Chris Anderson, Editor-in-Chief, of Wired Magazine at HP Conference, Discover 2012. Such is the case when, Chris Anderson, editor-in-chief of Wired Magazine takes the stand as keynote speaker of the Discover 2012 HP Conference. As he stands as an observer and commentator of the computer realm for quite some time, he sees how consumerism running the dictate of the future world of computer applications in the work environment and challenges big corporations or employers to keep up. What he says here is that people should be able to share ideas on the spur of the moment. Tablettes allow this ability. This capability, unlike past needs of having to find an office space or a white board to work on to continue a discussion of ideas interrupted the flow of ideas and required more resources. What Chris says is that we can not truncate the progress being made here. We have to keep open to allow various points of view that impact our products as we develop them. Many beta versions are tested by users and so this is the case with the future development of programs, apps and products. Chris indicates that people are dictated by the fashions of technology. He says that just because the corporate environment has decided on a direction, this does not mean that it is the right one. He indicates, for example, the the phone or tablette indicates who you are. He says that people see the technology is a personal reflection of them and so they are particular and quite specific as to what they will accept. He thinks the corporate environment should be open to letting people decide what they want. Chris speaks of an application being focussed and offering one type of service. He says it is not of any sense for a company trying to be of all things to all people. It is more important that an app be developed to deal with a certain area and do it extremely well. It is important to be focussed and not diverted in attention or diverse in areas. Chris speaks of the need to reconnect all our resources by having them up in the cloud. He speaks of the connectedness of the world and the many applications. This is only common sense and connects with the next point. Quite simply, this is a way of using resources to ensure everyone is contributing to the project. No longer do you need to monitor the effect of each individual’s contributions, as this is added automatically in a program like a Drop Box program. I am not sure he is saying get rid of GANTT charts and the long term visions with short term goals, but he is saying that there is a way to have people contribute in a timely way and this is automatically reflected by their respective contributions. Chris compares how his corporate enterprise restricts his email capabilities and so he turns to Google for Gmail. Why? Because it is attacked all the time but that they have the best people, men and women, who are constantly testing and protecting the resources. He chooses to go with consumer products that are protected and effective rather than the corporate restrictions of his own company. Honestly, I feel as if I am speaking to a Newfie. For those of you who are not Canadian, it simply means there is profound logic from someone in Newfloundland. 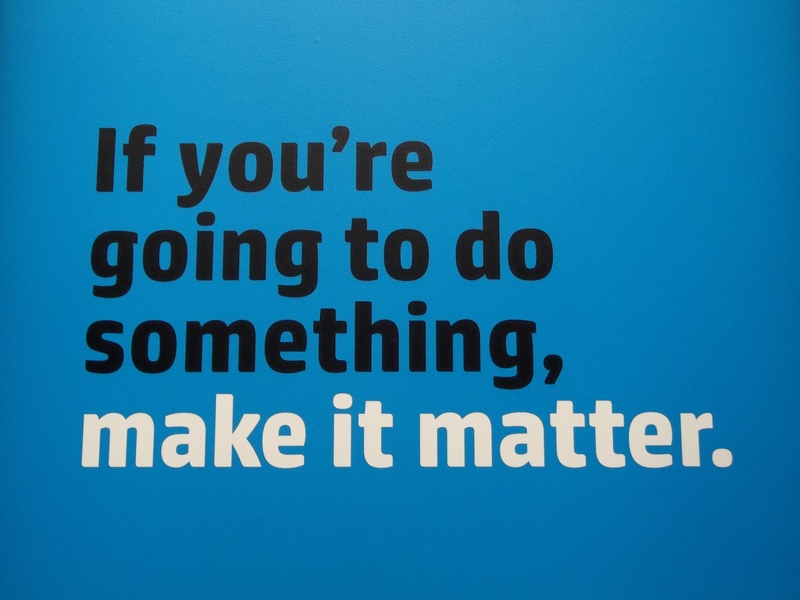 They have logical sayings like that, that stand the test of time – “Wherever you are, there you are.” It does not matter, it simply means that you are connected all the time and that you carry your career or identity with you. The above 10 points speak of the changing forces within the IT industry and the blurring lines of work and a passion of interests. People are no longer separating their professions but carry this identity with them as they work, live and play throughout life. Chris Anderson, as Wired Editor, has made an impact in his statement and for all the corporate structured Information Technology Experts, he is challenging to change the work environment to accommodate the client wants as they are more knowledgeable of the capabilities and limitations of what they want to do and to accomplish. The question is, can or will the corporate world let this really happen for various important reasons? Plus, does it really make logical sense to do this or is his mind up in the clouds and not based on what really happens in a corporate world structure?